Fostering a culture of respect, inclusiveness and diversity among students, faculty and staff. Our students will be provided with a strong technical and cultural education for their profession or for continued graduate education in an area of specialization. Our graduates will have the ability to work individually and in teams to identify and solve complex engineering and computer science problems and will have developed an understanding of interdisciplinary problem solving and system design. Our graduates will have a multi-disciplinary technical and practical education which has prepared them for a rapidly changing world based on the commonality of knowledge that engineering and computer science disciplines provide. This will allow our graduates to be able to continuously meet professional objectives throughout their careers. A firm foundation will be provided for professional advancement not just through acquired, advanced engineering and computer knowledge, but also through communication, humanity and social science skills, team and group activities and ethical/professional responsibility as engineers and computer scientists. The chemical, civil, computer science and engineering, electrical, environmental, materials science and engineering and mechanical engineering undergraduate programs are accredited by the Engineering Accreditation Commission of ABET, http://www.abet.org. The computer science and engineering undergraduate program is also accredited by the Computing Accreditation Commission of ABET, http://www.abet.org. Engineering majors currently have one of the highest rates of acceptance to U.S. medical schools. They also have an advantage over other majors in gaining acceptance to architecture, business, dental and law schools. However, engineering students may need to complete additional courses to gain the full benefits of their degree. Students interested in using engineering as a preparatory degree should consult with an engineering advisor and the Pre-Professional advisor in the University Advising Center. In addition to the University requirements for admission to the baccalaureate programs (see Admission section of this catalog), the College of Engineering highly recommends the following entrance requirements for its degree candidates: four units of mathematics (including trigonometry or pre-calculus), three units of science (including physics and chemistry), and a half year of computer programming. Advanced placement classes in calculus and science are particularly valuable. , MATH 182 ,MATH 283 , PHYS 180 , PHYS 180L and PHYS 181 . Students may attempt each of these courses a maximum of three times (including withdrawals and audits). Maintain at least a 2.0 Engineering grade point average (included on the Academic Advising Report in MyNEVADA). Students whose Engineering grade point average falls below 2.0 are placed on program probation at the end of the fall and spring semesters. Students on program probation will be required to meet with a University Advising Center advisor. Students will be allowed one semester to raise their GPA. Students will be allowed an additional semester if and only if the previous semester Engineering GPA increases. If the student is still not able to raise the Engineering GPA to a 2.0, they will be removed from the College of Engineering. Students who are not eligible to progress from the undeclared engineering program to a specific engineering major after four regular semesters and/or those who do not meet the progression and major grade point average requirements above will be removed from the College of Engineering. Disqualified students will be moved into undecided status and will be required to meet with an advisor in the University Advising Center to select a new major. Students will have one semester to choose a new major. After one year, undergraduate students who have been removed from the College of Engineering may petition to be reinstated on the basis of transcript evidence that they are now capable of meeting the College’s progression standards. A petition including a letter to the committee from the petitioner, letters of support from faculty and/or advisors, medical records, transcripts from transfer institutions, etc. must be submitted to the College of Engineering Advising Office (EJCH 108) by April 1st to be reinstated for fall and by November 1st to be reinstated for spring. 1 Because the coursework is so interdependent, students who must complete preparatory courses, e.g., MATH 96 , MATH 126 , and/or MATH 127 should plan to attend summer school prior to their freshman year. Baccalaureate Degrees: Upon satisfactory completion of the prescribed curriculum, engineering students are awarded the degree of bachelor of science in biomedical engineering, chemical engineering, civil engineering, computer science and engineering, electrical engineering, engineering physics, environmental engineering, materials science and engineering or mechanical engineering. 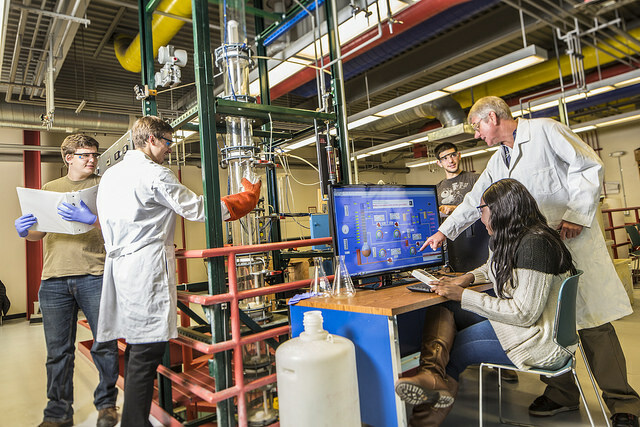 Minors: The College of Engineering offers undergraduate minors in batteries and energy storage technologies, civil engineering, computer science and engineering, cybersecurity, digital interactive games, electrical engineering, engineering physics, environmental engineering, extractive metallurgy, materials science and engineering, mechanical engineering, manufacturing quality, nanotechnology*, renewable energy*, and unmanned autonomous systems. Specific requirements can be found under the appropriate department or program. It is mandatory for students to satisfy all prerequisites before entering an engineering or computer science course. Graduate Degrees: Subject to the general requirements of the University, the corresponding department and the UNR Graduate School, the following degrees may be earned. Master of Science: biomedical engineering, chemical engineering, civil and environmental engineering, computer science and engineering, electrical engineering, hydrological sciences*, materials science and engineering, and mechanical engineering. In any major field of study, the degree requirements consist of the University Core Curriculum requirements and the departmental major requirements. Transfer students may meet Core Curriculum and departmental requirements with similar course work from other colleges and universities. To satisfy degree requirements, students must earn a total of at least 122 to 129 semester credits depending on the degree program. In addition to the University requirement of at least a “C” (2.0) average for graduation, College of Engineering students must maintain at least a “C” average in the core mathematics, core science and the major requirements courses. College of Engineering students must also earn at least a “C” in courses designated with an asterisk (*) as shown in each of the degree requirements. The “C” requirement applies to all students including transfers. Most courses required by the College of Engineering students have prerequisites and/or corequisites. Satisfying these requirements is mandatory. Course prerequisites will be enforced in MyNEVADA. When the College of Engineering requires a “C” or better for a course, then this requirement must be met before continuing to a course that has it as a prerequisite. Engineering students may register for a maximum of nine satisfactory/unsatisfactory (S/U) credits in courses not specifically required in the core curriculum and departmental requirements. This limitation does not apply to AP credits transferred to the University. Students may enroll in non-repeatable courses twice without special permission. Non-repeatable courses are those in which credit can be earned only once. Effective for the Fall 2016 registration period, a College of Engineering academic advisor’s permission is required to enroll in a non-repeatable course a third time. For program required courses that count toward the engineering GPA, if the student is unsuccessful at the third attempt, the student must appeal to the department chair for an additional (fourth) attempt. If the appeal is denied, the student must meet with the University Advising Center (UAC) to explore other majors as the student will not be able to continue in their current engineering major. The Nevada System of Higher Education (NSHE) Board of Regents has approved a differential fee that applies to upper division (300-400 level) and graduate level courses in the College of Engineering. Please see the Cashier’s Office website for current fee structure: http://www.unr.edu/tuition-and-fees. Course requirements in the College of Engineering may include field trips as an integral part of the educational experience. Field trips may be scheduled by the college’s student organizations and may also be organized by the college’s faculty to meet educational goals and needs. All freshmen, sophomores, and incoming transfer students are required to meet with College of Engineering academic advisors. There is an advising hold placed on the student’s account in MyNEVADA and the hold is removed by the academic advisors after the student has completed the mandatory advising. Juniors and seniors should meet with their faculty advisor prior to registration to discuss questions regarding upper division coursework, career goals or graduate schools. A student from outside the University of Nevada, Reno, who wishes to be accepted into the College of Engineering must follow general University policies for admission. Transfer students must schedule an appointment to meet with one of the College of Engineering academic advisors once they have been admitted. Several internships are available, in which students may gain practical experience during the summer (three months), a semester, or for an academic year. For details, please refer to the major department or contact the College of Engineering Internship and Career Coordinator at (775) 682-7736. Today’s engineers are often called on to solve problems with global impact. The College of Engineering has established exchange programs with top technical universities worldwide to expose students to engineering in other cultures. English-language course offerings make study abroad accessible and programs that span in length from a few weeks to one year allow students to customize their experience. Studying abroad can be a life changing experience. Students will be exposed to new ideas, new people, and new experiences. Furthermore, students will develop some of the skills most valued by today’s employers: independence, teamwork, leadership, and adaptability. The College of Engineering currently has exchange opportunities available in the following locations: China, Germany, Italy, Poland, Spain, and South Korea. The College of Engineering also offers summer internship/research opportunities in China, Germany, Spain, and Hong Kong. In an exchange program, students pay University of Nevada, Reno tuition and fees, and are generally exempt from tuition at their host university. Students may have to pay for some fees at their host university for student services, housing or other campus services. Check with the Office of International Students and Scholars and the student’s host institution for more specific information and program fees. Students are also responsible for their own travel and living expenses while living abroad. To help with the costs, the College of Engineering offers $500 scholarships to eligible students participating in an exchange program. Please contact Julia McMillin in the College of Engineering at juliamcmillin@unr.edu for additional information. Candidates for graduation should submit a graduation application one semester prior to the anticipated graduation date after meeting with the major advisor. The due dates for graduation applications can be found in the University’s online calendar and the general catalog (catalog.unr.edu). Only Admissions and Records can certify that a student has officially met all graduation requirements. An accelerated bachelor’s/master’s degree program enables outstanding students to obtain a master’s degree in engineering or a master of business administration in a shorter time. Data from the National Science Foundation shows that approximately one-third of engineering and computer science degrees in the United States are master’s degrees, and graduate education is increasingly necessary for leadership and management roles. Admission and program requirements about these programs can be found on the College of Engineering website and in the University catalog.